Origin and Habitat: Boswellia nana is a rare endemic plant from the, Soqotra island, Yemen. It is only known from two locations (Hamaderoh, south-facing slope above the plateau and Majhah escarpment on limestone rock-face) with a total area of occupancy of less than 20 km². Altitude range: 300–550 metres above sea level. Habitat and Ecology: Boswellia nana grows in perfect camouflage in crevices on limestone cliffs and limestone pavement often covered by a thick coating of lichens, in dry, semi-deciduous woodland in the Northeast of the island. The plants grows as a small vertical shrub or sometimes totally prostrate together with Echidnopsis insularis, Sarcostemma socotranum, Gnidia socotrana, Acacia pennivenia, Acridocarpus socotranus, Anisotes diversifolius, Ballochia rotundifolia, Carphalea obovata, Commiphora socotrana, Cryptolepis intricata, Jatropha unicostata, Lannea transulta, Rhus thyrsiflora, and Croton pachyclados, just to cite a few of the more common. 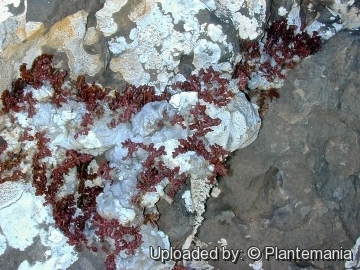 Several of the eight species of Boswellia known to occur on Socotra, all endemics, are restricted to limestone cliffs and huge boulders, mainly below about 600 m. These species, Boswellia bullata, Boswellia dioscorides, Boswellia nana and Boswellia popoviana possess swollen holdfasts roots which help to support the stems on walls, and rocks. By forcing their way into minute pores and crevices, they hold the plant firmly in place to even vertical cliffs in which they germinated. 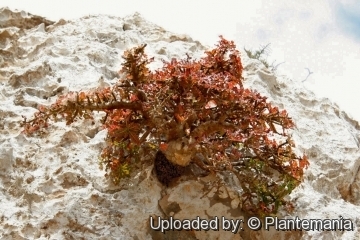 Description: Boswellia nana is a prostrate or pendent dwarf tree, perhaps the most ornamental of the frankincense genus, with a very unusual, compact, bonsai-like habit, growing up to about 60 cm above the ground level or hanging 60-100 cm down the cliff-face. Stems: Short and compact with a bottle-shaped base (caudiciform). 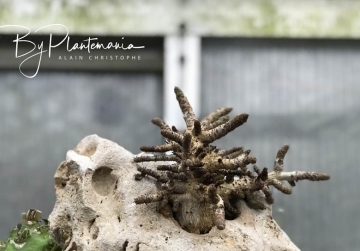 In cultivation, especially when grown in the ground, the plant can reach 1 or more metres in height with a thick base hardly resembling the plant in its natural habitat. Leaves: Typically unifoliolate (one-leafed), with a very small pair of caducous pinnae at the base of the lamina, glossy green above with glabrous undersurface. However in habitat the leaves vary from simple to pinnate with winged rachises. The variations of the forms are attributed to natural hybridization. Flowers: Showy pink to rosy-red. Ovary three-(or more)-loculed. The flowers of Boswellia nana appear singularly at the end or side of new growth or as a flower stalk with few, complete flowers. This condition is environmental, and the health and condition of the plant in cultivation determines the results. Taxonomy notes: Boswellia nana has a very unusual habit for Boswellia, but quite variable. It is recognized as a complex of low, sometimes totally prostrate shrubs and small trees found in a relatively restricted area of Northeast Soqotra. Thulin and Al-Gifri (1998) regarded Boswellia nana as a reduced form of Boswellia popoviana. However, it differs from that species in its smaller, more reduced panicles of red, not yellowish flowers and the glabrous not white-felted undersurface of its leaves, moreover B. popoviana has a more normal and larger habit. 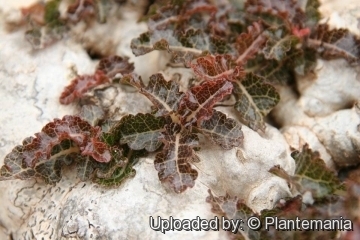 Certain plants from inland cliffs in Northeast Soqotra, included under B. nana, show great variation in the degree of the division of their leaves and in their habit, maybe the result of hybridization with Boswellia socotrana. Populations of B. nana found on the seaward-facing escarpments of northeast Soqotra bear only simple leaves. Pink flowers also occur in Boswellia ameero, which is otherwise quite different, for the flowers of B. nana occur in small terminal fascicles rather than on an inflorescence. 1) Wikipedia contributors. "Boswellia nana." Wikipedia, The Free Encyclopedia. Wikipedia, The Free Encyclopedia, 20 Sep. 2015. Web. 7 Jan. 2016. 2) Miller, A. 2004. "Boswellia nana." The IUCN Red List of Threatened Species 2004: e.T44814A10950258. http://dx.doi.org/10.2305/IUCN.UK.2004.RLTS.T44814A10950258.en. Downloaded on 06 January 2016. 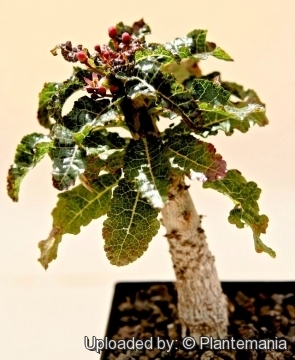 4) Thulin M. and Al-Gifri “The frankincense trees (Boswellia spp.) of Soqotra” in: Dumont HJ (ed) Proceeding of the first international symposium on Soqotra Island: present and future. United Nations, New York. 5) Tucker A.O. “Frankincense and Myrrh,” Economic Botany, 40(4), 1986, pp. 425-433. 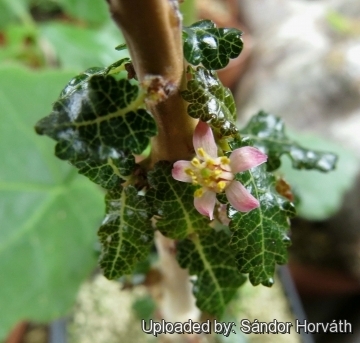 10) «International Succulent Introductions: Plant Introductions of the Huntington Botanical Gardens – Boswellia nana». San Marino, California: Huntington Botanical Gardens. <http://web.archive.org/web/20150325150552/http://www.huntington.org/BotanicalDiv/ISI2006/isi/2006-15.html> Web. 7 Jan. 2016. 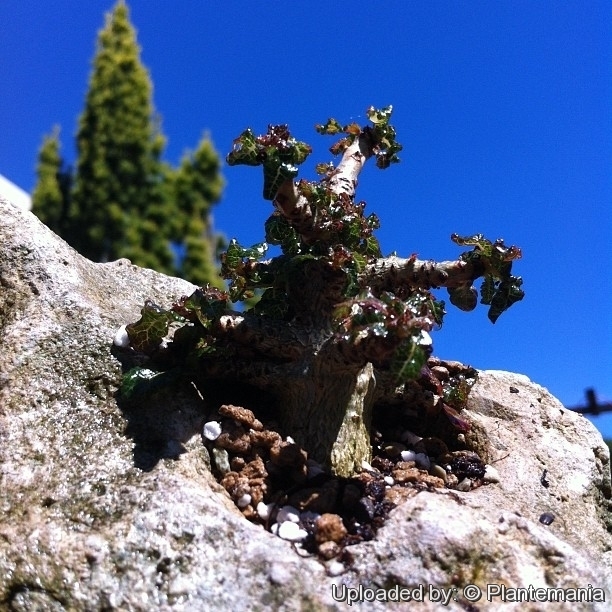 Cultivation and Propagation: The size and structure of the plant as a whole was greatly influenced by growng conditions, making the plant a short and compact bonsai like caudiciform or a more normal bush or small tree. It is a beautiful container plant, and it seems to like the container as much as being planted in the ground. It will be an indoor bonsai in all but the warmest climates. Light requirements. Needs lots of light and fresh air. Water requirements. Keep warm and moist at winter, as the winters on Socotra. But reduce water, especially when kept cool. Increase water during growing and blooming periods. The total watering needed is similar to other succulents, and it will lose leaves if overwatered. Fertilization: Feed monthly during spring and summer with liquid bonsai fertilizer. Temperature requirements: Keep in a bright location in winter (minimum temperature 12-15° C). However, in the winter, keeping it cool gives the plant a needed rest. In summer, if possible, move outdoors to a sunny or partly shaded location. 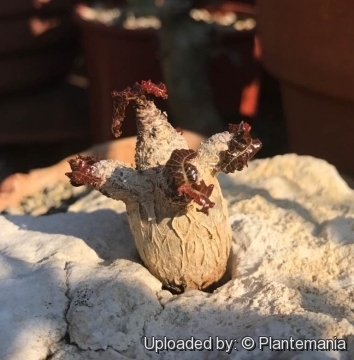 Maintenance: It has a large caudex with few short thin branches and do not need a heavy pruning after the plant's rest period as requested by other species. Eventually pruning should be kept to a minimum. 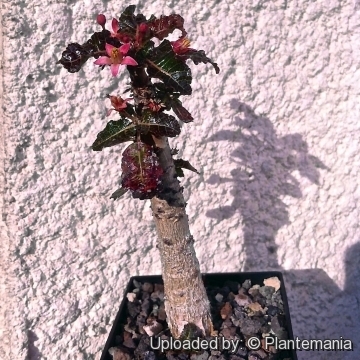 Repotting: Root prune and repot every two years, after the winter rest period, in a mix of 2 parts bonsai soil, 2 parts peat, and one part sand. Can tolerate being pot-bound. Propagation: It is possible to root cuttings.